Welcome to this edition of the IAAI’s CFITrainer.Net podcast. We’ve been getting good feedback on sharing news with all of you so we will continue to do so. We will also be working on some new interviews as we have in the past. As always we love getting your feedback. Feel free to use the form on this podcast page to let us know what you’re thinking. After these brief stories I want to share a few pieces of information that are news from the IAAI. For now, let’s get to some fire investigation stories from around the globe. The UK’s Lancashire Fire and Rescue Service has determined a fire at the Colne Health Centre was caused by an electrical fault in the facility’s solar photovoltaic power system. According to Solar Power Portal, the component involved has not yet been identified. Concerns about solar power systems as potential fire causes have been growing in the industry, but many investigators do not yet have specific training and experience in evaluating solar power system components as a potential fire cause. The Building Research Establishment, a former UK government laboratory now owned by a charitable trust that provides building science research, testing, certification, and standards, released a study in 2017 that looked at more than 50 fire incidents where a solar power systems were involved. In 36% of the cases, installation error was the cause. Component fault was the cause in 12% of the cases. System design was identified as the cause in 5% of cases. Perhaps most tellingly, in almost half the cases, no cause was identified. Clearly, there’s a lot of work to be done to better understanding these systems and evaluating them as a potential fire cause. Just an FYI, our new grant application to the Fire Prevention and Safety Grant Program includes new training to be delivered on CFITrainer related to solar and new technologies that effect homes and vehicles. We have our fingers crossed that we get the funding this round. Scientists at the Anglia Ruskin University tested the flammability of emollients common in skin creams, lotions, and ointments, both with and without a paraffin base, and found that the presence of a dried emollient increases the flammability of textiles. Their findings are published in Fire Safety Journal and were presented at the UK Association of Fire Investigators conference. Control fabrics made of cotton and polycotton blends ignited in an average of 65 seconds when exposed to a nearby open flame. The same fabrics, when a dried emollient residue was present, ignited in less than 20 seconds. Glowing combustion time was also increased, leading researchers to be concerned about the potential for severe skin burns. The research suggested that the structure of the textiles acted as a wick to increase volatility for quicker ignition. Ignition scenarios affected by the presence of dried emollients include situations like ignition of emollient-contaminated clothing or bedding by smoking materials or heating elements. The hope is that research can identify the responsible ingredients and determine effective methods of removing these emollients from fabrics like clothing, as current washing methods may be insufficient. The full study, which was prompted by actual fire cases involving use of emollients., can be found in Fire Safety Journal. The Canadian Institutes of Health have commissioned a study from Lakehead University to look at job-related, post-traumatic stress injuries in Thunder Bay Fire Rescue personnel. Preliminary data from Dr. Kathryn Sinden showed that 94% of TBFR firefighters experience at least one critical event over a two month period, and that 79% of those events involve at least one or two deaths and 54% involve children. The study will attempt to assess the burden of critical incident exposure on fire service personnel, the incidence of post-traumatic stress injury, the impact of delivering behavioral health services to cope with these exposures, and how to modify the behavioral health programs, strategies, and resources available to TBFR personnel. All personnel who work fire cases are exposed to upsetting situations and details, which studies have shown can significantly affect responders in both the short- and long-term. It’s important to take care of both your physical and mental health. For more information on critical incident exposure and behavioral health programs like stress first aid, CFITrainer.Net recommends visiting the Fire Hero Learning Network from the National Fallen Firefighters Foundation, which can be found at fhln.net, take their online modules on firefighter health and safety, particularly Stress First Aid and Fire and EMS Personnel. Hope you found these articles informative. Check the links on the page for more information on all of the stories. As always, we welcome your feedback on the podcast and we use the input to help guide the topics we cover. We read everything and do our best to respond to your comments. By the way, we are often getting universities and other institutions interested in CFITrainer as a resource for classes and courses. Past the word over 10,000 students are already registered and the USFA is using us for mandatory prerequisites for their training. The list goes on. CFITrainer is well woven in training and education across our nation. We are impressed by this and proud to have the opportunity. If you are a member of the IAAI or not you should know that the IAAI’s International Training Conference is less than two months away, in Jacksonville, Florida. Being at an ITC is well worth the time and can change your career. You can be with like-minded folks from around the world. Share ideas, network and learn more in one week than you probably could anywhere else in the world. Remember you need to keep NFPA921 and 1033 requirements in mind. This year’s topics include vegetation fire investigation, a special track for insurance claims and investigation, co-sponsored by ICAC. Marine fire investigation and marine surveying for investigators, complex death scenes, and fire death and investigation plus a whole lot more. You can learn about the ITC by going to www. iaaiitc.com or go to FireArson and click from there. Don’t miss a great experience, it’s worth the time and the investment. We know this is true from many of our members and others because once they come to an ITC, they end up coming year after year. Jacksonville Florida, you and hundreds of others involved in fire investigation. We hope you can make that happen this year. If you are a member then you probably know that voting for the 2019 election for your board is open and you should of received a ballot via email. If you have not received a ballot, take a look at your spam filter for the email from IAAI office at FireArson.com via SurveyMonkey. Bring it to your inbox, then it only takes a few minutes to click through the ballot, and help decide who will help drive the vision of the IAAI in the future. We hope to have you join us next month for the podcast we’ll have news as usual and we are planning a special guest from ATF&E to let us know what they are doing to support fire investigation at the federal, state and local level. Thanks for joining us today on the podcast. Stay safe and we’ll see you next time on CFITrainer.Net. For the IAAI and CFITrainer.Net, I’m Rod Ammon. Solar fault found to be cause of Lancashire Health Centre Fire. Solar Power Portal. 19 Feb 2019. Fire Hero Learning Network. FHLN.net. National Fallen Firefighters Foundation. LU researcher to study post-traumatic stress injuries in Thunder Bay firefighters. TBNewsWatch.com. 9 Feb 2019. Researcb shows hidden fire risk of emollients. Fire & Security Matters. 5 February 2019. Hall, S. et. al. The flammability of textiles when contaminated with paraffin base products. Fire Safety Journal. Vol 104, March 2019, pages 109-116. 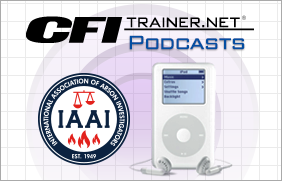 March 2019 Podcast - March '19 IAAI & CFITrainer Fire Investigator Podcasts. This month's podcast includes updates from the IAAI related to the election, the upcoming ITC, and a new website specifically about evidence collection. After the updates, you will also hear some news stories related to fire investigation.